Tea leaves are identified using neural networks. Credit: J. Marcos Jurado et al. 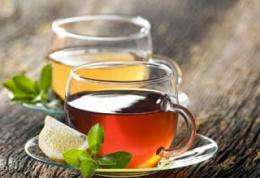 A team of chemists from the University of Seville (US, Spain) has managed to distinguish between different kinds of tea leaves on the basis of their mineral content and by using artificial neural networks. This technique makes it possible to differentiate between the five main varieties of tea - white, green black, Oolong and red tea. "This method makes it possible to clearly differentiate between the five types of tea - something that is often not easy to do by eye alone - by using analysis of the leaves' mineral content and then mathematically processing these data", Jose Marcos Jurado, co-author of the study and a researcher at the US, tells SINC.